Since long ago, mankind has had the desire to find treasure. In the past, this required maps, legends or a whole lot of digging and hoping to find something. Today, metal detectors give us the unique opportunity to glimpse beneath the surface of the ground without breaking a sweat. Since the value of treasure is in the eye of the beholder, it is personal preference that will dictate whether treasure hunters search for coins/relics or gold nuggets and, as a result, which brand of metal detector will best fulfill those needs. A great brand option, Minelab was founded in 1985 and continues to set new standards in innovation and to increase detectorists success rate in the field. In the not so distant past, metal detectors were purchased, used a few times and then assigned to a lonely shelf in the garage. “Too heavy” or “too complicated” were often the reasons given to stop detecting. Collapsible – No assembly required. These full-size metal detectors fold neatly to a compact 22 inches, easily fitting into a small backpack, gym bag or suitcase. Lightweight – They weigh just over two pounds. Waterproof (coil) – The waterproof coil is submersible up to two feet under water. Opens up detecting on the beach, in the rain, or in creeks or rivers. Smartphone Bluetooth integrated – A free app helps identify coins, view detector information and even play music. Minelab has become known for producing top-end gold machines. 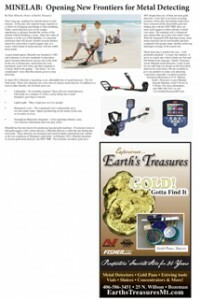 If someone wants to find gold nuggets with a metal detector, a Minelab detector is often the one finding the most gold. These detectors are designed and tested in highly mineralized soil, similar to the soil conditions of Montana’s gold fields. In February 2015, Minelab launched its newest gold metal detector: the GPZ 7000. This machine can detect gold up to 40% deeper than any of their previous gold detectors. Users have even been revisiting locations where they had already believed to have extracted all the discernible gold and finding that with the GPZ 7000, there are more gold nuggets in these already worked over areas. The standard coil is waterproof and submersible up to three feet under water. With the integrated GPS and map screen, areas being searched can be downloaded and then compared with google maps, thereby achieving thorough coverage of the search site.